I’m always looking for new curries to make and this one fits the bill perfectly! Rich and tasty, this unusual lamb curry makes a nice change from my tried and tested favourites of rogan josh and chicken kadhai. 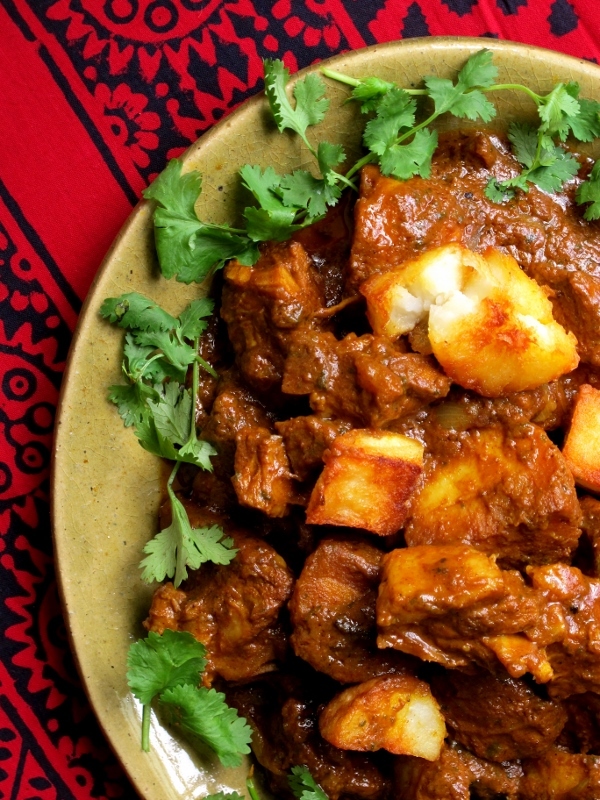 Whilst gosht shahajani is in many ways similar to gosht aloo, I love the idea of adding the precooked “roast” potatoes to the dish, instead of boiling them in the curry’s sauce. Of course, the potatoes inevitably lose their crunch when added to the sauce, but they do add a texture and flavour to the dish that sets gosht shahajani apart from similar curries. My version of this dish has evolved quite significantly from the original recipe, as I found the quantities a tad excessive – 150ml of tomato purée and 10 tablespoons of chopped fresh coriander for 800g of lamb? I adore flavour, but even my palette has its limits! I also prefer to fry my potatoes and onions in ghee rather than oil, as this gives them a fuller flavour and consequently, a greater presence in the dish. If you don’t have any ghee or prefer not to use it, you can just substitute it with vegetable oil.